This doesn’t need to be an adversarial debate. No one doubts that the river system is different to how it was in the past. The debate is over the consequence of 1) much dredging at Bure mouth and 2) much more dredging of the entire system. Since 2 is going to cost many millions it isn’t even a possibility. So will more dredging in the Lower Bure have the effect some claim? Ie lowering the average level in the northern system. BESL seem to suggest not. Also, what other consequences will that have. Would running aground at Hickling be an acceptable consequence of lowering the average level at Potter? Other navigation authorities manage to provide dredging programmes throughout their catalogue of waters. Why should the BA be any different? We have moored at Marina Quays on one of the boats we hired Brink of Joy. Must have been 13 years ago. The boat broke down with catastrophic gearbox failure part way between Stracey Mill and Marina Quays. We had to get towed into Yarmouth and the boat that towed us got us there. The place was derelict of course but we were moored up and safe. The yard staff spent all day fixing the boat there and we spent the evening moored there. So we were there for a good few tides. Can't remember the boat bottoming out at all. The keg, I believe that's the correct term, should protect the propeller and rudder while on the mud. 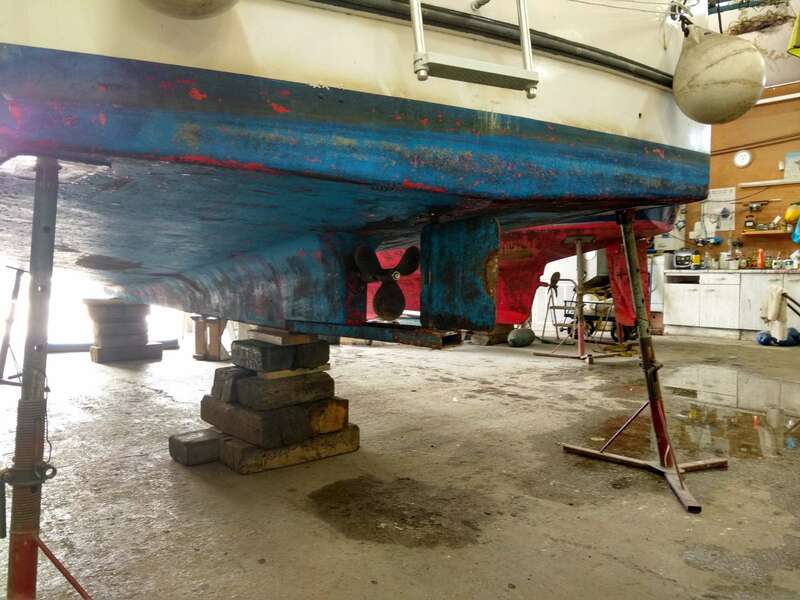 The strong metal "arm" from the end of the keel to the bottom bearing of the rudder. Here we have our keg. Note the lack however of a skeg! Hopefully no damage sustained to any boats!! You are funny. I notice the storage of the beer ranks way above your everyday tucker. Loads of food storage in the fridge now. With the old fridge it was always a struggle and sometimes it was a choice between beer or food! Thats brilliant if you can have it set on 1 or 2, frozen beer, oh dear, you could start a new trend in ice lollies. Bet the freezer section is fantastic. As someone who used to always bring fresh meat vacuum sealed to the boat to use for several days a really good freezer would have been a real bonus. Yes. We will certainly find the freezer useful when we are out on holiday. We also like to stock up with vacuum packed meat when we find a decent butchers. It is a decent size as well. Can't believe how much beer we can fit in and still have loads of space for food. Luxury compared with the old fridge. The Engel it has replaced was quite efficient anyway but was noisy. But as you say it did struggle to keep cool on really hot days. The Waeco seems to have a lot more insulation so will hopefully be a bit better on that score. We were caught out by how much colder it gets as it froze the beer! It is on a much lower setting then the old fridge but still getting ice cold. Lord knows what the higher settings are for. We have it on setting two of five and the beers are ice cold. We have moored at North Cove and not realised there is a pub or two within walking distance. Maybe one to try when we are down again next year. The only way to stop the mould growth is to provide lots of ventilation. Ventilation keeps the air moving which reduces condensation which in turn prevents the moisture build up that the mould needs to grow. If it got to the point where I was really struggling to get on and off the boat then at that time it would be time to hang up the hat and find another hobby!! I am also a shortie, 5'3" and not claiming to be the most agile but can't really think of a time on the Broads on our own boat or a hire boat where I have struggled to get on or off. Climbing the ladders at Great Yarmouth at low water Springs was not my most enjoyable experience I will say but neither was it overly difficult. I’m the same as Monica on this one. Hubby does the ropes as he is stronger and more sure footed than me. I’m at the helm for mooring up and getting away. We’ve watched so many couples doing it the other way round and really struggling for the lady to manage getting off. Or one man simply doing it all while everyone else on board sits and watches! If the person getting off with the ropes is struggling then the person at the helm really needs to get the boat alongside and under better control. In our case it will usually be Liam at the helm and me doing the ropes. He knows that I will not step off the boat until he has it under full control and close alongside where he will hold it until both bow and stern and any spring lines are secured. No tugging and pulling at ropes or the boat. Let the boat do the work. There seems to be few people like that Mrs H, and no matter how many times I point out they'll never learn unless you try, it seems to make no difference whatsoever. It is surprising just how many people you find on boats who have no interest in learning how to handle it be that driving or mooring up. We made a point of both of us learning how to handle our boat and being able to handle it on our own without another crew member just in case one of us falls ill during a cruise. The other can then take it home single handed. Good job too because there have been two occasions now where Liam has been taken ill and I have had to get the boat back to base alone! North & South, Where Is The Line? Hi pumpmedic and welcome to the forum. Not a stupid question at all. The northern and southern broads meet at Breydon water. Which is the inland sea just to the north east of Great Yarmouth.